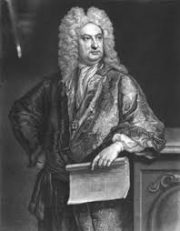 Sir John Vanbrugh (24 January 1664 (baptised) – 26 March 1726) was an English architect and dramatist, perhaps best known as the designer of Blenheim Palace and Castle Howard. He was buried at St Stephen Walbrook. John Vanbrugh wrote two argumentative and outspoken Restoration comedies, The Relapse (1696) and The Provoked Wife (1697), which have become enduring stage favourites but originally occasioned much controversy. He was knighted in 1714. Vanbrugh was in many senses a radical throughout his life. As a young man and a committed Whig, he was part of the scheme to overthrow James II, put William III on the throne and protect English parliamentary democracy, and he was imprisoned by the French as a political prisoner. In his career as a playwright, he offended many sections of Restoration and 18th century society, not only by the sexual explicitness of his plays, but also by their messages in defence of women’s rights in marriage. He was attacked on both counts, and was one of the prime targets of Jeremy Collier’s Short View of the Immorality and Profaneness of the English Stage. In his architectural career, he created what came to be known as English Baroque. His architectural work was as bold and daring as his early political activism and marriage-themed plays, and jarred conservative opinions on the subject. Vanbrugh’s London career was diverse and varied, comprising playwriting, architectural design, and attempts to combine these two overarching interests. His overlapping achievements and business ventures were sometimes confusing even to Vanbrugh himself. It has been suggested that Vanbrugh had no previous training in, nor studied architecture, but applied himself to the discipline whole-heartedly. Seaton Delaval Hall, begun in 1718. Vanbrugh’s prompt success as an architect can be attributed to his friendships with the influential of the day. No less than five of his architectural patrons were fellow members of the Kit-Cat Club. In 1702, through the influence of Charles Howard, Earl of Carlisle, Vanbrugh was appointed comptroller of the Royal Works (now the Board of Works, where several of his designs may still be seen). In 1703, he was appointed commissioner of Greenwich Hospital, which was under construction at this time, and succeeded Wren as the official architect (or Surveyor), while Hawksmoor was appointed Site Architect. Vanbrugh’s small but conspicuous final changes to the nearly completed building were considered a fine interpretation of Wren’s original plans and intentions. Thus what was intended as an infirmary and hostel for destitute retired sailors was transformed into a magnificent national monument. His work here is said to have impressed both Queen Anne and her government, and is directly responsible for his subsequent success.